MADISON, Wis. — Ted Cruz surrounded himself with women — including his mother and wife — at a campaign stop in Wisconsin Wednesday, where he tried to show a softer side to further contrast himself with his brash Republican rival Donald Trump. Cruz’s wife, mother and former rival Carly Fiorina joined him for what Cruz called a “celebration of women.” They cast Cruz as the best choice for women voters, while Trump continued to face questions about his defense of his campaign manager who was charged Tuesday with simple battery after an altercation with a female reporter. Cruz and Trump have also been engaged in a nasty, personal battle that reached a high point last week when Cruz accused Trump and “his henchmen” of stoking false rumors that he’d cheated on his wife. Critics have pointed to both developments as examples of why Trump will have a hard time attracting women in a prospective race against Hillary Clinton, the Democratic front-runner. It was a soft-spoken Cruz who took the stage Wednesday, sitting next to Fiorina, his wife and 81-year-old mother Eleanor. Cruz didn’t mention Trump during the hour-long event. Cruz’s former rival Fiorina was the only one who made a passing reference to Trump, saying he represents the powerful, wealthy establishment figures who benefit from the current tax structure and would fight against Cruz’s plan to simplify it. Otherwise, the forum gave Cruz, his mom and wife the opportunity to show a more personal side than usual just six days before Wisconsin’s primary on Tuesday. “It’s not an easy time for our family to do this,” Heidi Cruz said of the presidential run, referring to their two young daughters, 7-year-old Caroline and 5-year-old Catherine. Heidi Cruz has taken a leave of absence from her position at Goldman Sachs to campaign with her husband. 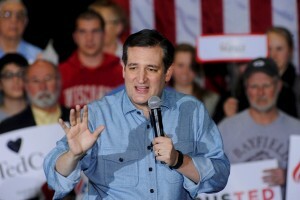 Cruz’s mother rarely makes public appearances and Cruz said this marked the first time she had ever done such an event. She told stories about Cruz as a high school student reading books on economics and memorizing the Constitution. “When he was studying the Constitution, he would spend hours in front of myself and his father reciting it and learning the gestures that went with it,” she said. A new poll released Wednesday showed Cruz doing better than Trump in Wisconsin, both with women and voters overall. Cruz is leading Trump by 10 percentage points among likely Republican primary voters in Wisconsin, and by 15 percentage points among women, according to the Marquette University Law School poll. The poll, which has a margin of error of plus or minus 5.8 percentage points, showed Cruz ahead of Trump 40 percent to 30 percent. And among women, 39 percent supported Cruz compared with 24 percent for Trump.